In 2105 we have had a look at previous 10 drafts to see how rookies fared in their first pro season. From that we learnt 10 lessons, which could help us drafting future rookies more effectively. But the time moves fast and we’ve had 3 classes completing their first season as pros since then. 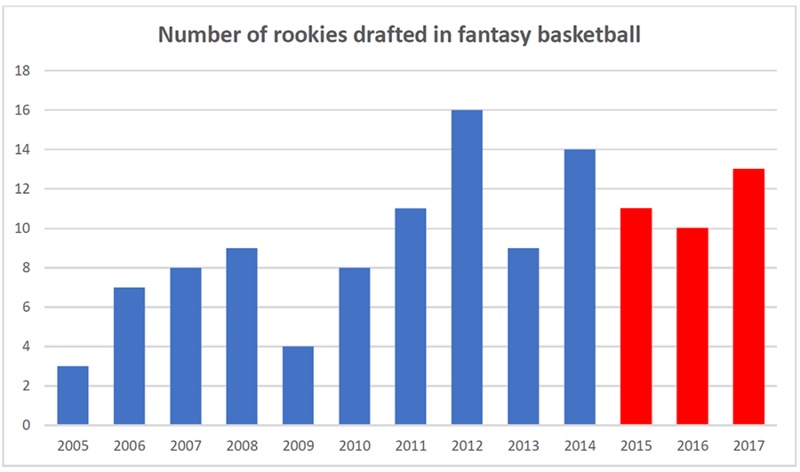 So let’s have a look at how the rookie landscape has changed and if fantasy managers modified their approach to drafting them. Last 3 seasons number of rookies targeted during fantasy drafts remained high. Between 10 and 12 first year players were selected each time. The odds were not great, but if you wanted to build on rookies – that was the year to do it! 2015-16 was one of the best seasons to draft rookies since two of them ended up in Top50 ranking (9-cat), which hasn’t been the case since….Tim Duncan and Zydrunas Ilgauskas back in 1997-98. KAT and Porzingis were simply amazing, beating all expectations and winning many leagues for their managers. But there were several other rookies worth a mention. Myles Turner and WCS turned out to be fringe rotation players. Jahlil Okafor was overdrafted, but definitely was not a bust. Unfortunately his rookie year was also his best so far. Others – well – they played more like rookies and were quite useless for fantasy purposes. What goes up – most come down. What a beautiful disaster that was! managed to play only 31 games. It was the worst rookies class for fantasy since we have started looking at data! had an ADP in Top100, so kudos for managing your expectations. Let’s not spend too much time here. It’s too dark. And then there was last season. Fate of this rookie class was highly impacted by injuries. Simmons played more like someone who spent a whole year learning about NBA. Injury to Gordon Hayward forced Jason Tatum to mature in a matter of days rather than months. John Collins benefited from the Hawks rebuilding project which included actively working on their lottery position and developing youngsters rather than fighting for the win in each game. Markelle Fultz had his rookie campaign cut to only 14 games – thanks to his injured shoulder. Lonzo missed a lot of time and showed a lot of promise but was simply drafted too early. Markkanen might have been the biggest prize of the Jimmy Butler trade to Minnesota. He certainly looks like a modern version of an offensive big. A lean 7-footer with a deadly 3-pointer. Dirk Nowitzki version 2.0? But the biggest surprise was Donovan Mitchell. He took the league by the storm and became highest ranking rookie who was selected outside of Top10. Four rookies ranking in Top75 is unprecedented and goes against anything we’ve seen over the years. So the lesson (#11) here is to remember that and to not get carried away with the class of 2018. Luka Doncic will be great. Trae Young and Colin Sexton possibly too. Ayton, Bagley, Bamba may be the next crop of great big man. But do not set your expectations for them based on how many solid rookies we have seen recently. Remember that not only pure talent makes a good rookie in fantasy. It’s also your ability to not overvalue them and draft too early. Lesson #11: Do not get carried away even if several rookies in recent past were better than expected.